Scientists at the European Space Agency (ESA) and Italian-based space company SITAEL reached a major milestone for the future of satellite tech with the recent testing of an electric ion thruster, the first of its kind in the world. The new "air-breathing" thruster replaces the heavy onboard xenon propellants used in other thrusters and runs instead on thin air from the top of our atmosphere. Previously, ESA satellites were limited by their xenon supply. When the propellant ran out, the mission was over. With the new electric ion thruster, satellites will be able to operate at low orbits for longer periods of time. "This project began with a novel design to scoop up air molecules as propellant from the top of Earth's atmosphere at around 200 km (124 mi) altitude with a typical speed of 7.8 km/s (4.8 mi/s)," said ESA researcher Louis Walpot in a statement. During the development process, the ESA ran various computer simulations before working with SITAEL to build a prototype and test it inside of a vacuum chamber. After testing the prototype with the traditional xenon propellant, the researchers switched to a nitrogen-oxygen air mixture. "It all came down to this practical test to know if the combined intake and thruster would work together or not," said Walpot. "Instead of simply measuring the resulting density at the collector to check the intake design, we decided to attach an electric thruster. 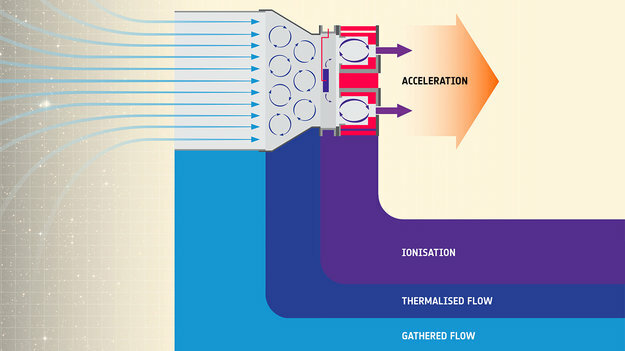 In this way, we proved that we could indeed collect and compress the air molecules to a level where thruster ignition could take place, and measure the actual thrust...When the xenon-based blue colour of the engine plume changed to purple, we knew we'd succeeded," he added. "Finally, the system was ignited repeatedly solely with atmospheric propellant to prove the concept's feasibility...this result means air-breathing electric propulsion is no longer simply a theory but a tangible, working concept, ready to be developed, to serve one day as the basis of a new class of missions."